Another successful Expo was held on Saturday 13 April. 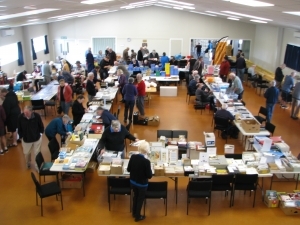 A good range of societies in the region had sales tables manned by their members throughout the day and were complemented by dealers in stamps, coins and postcards. This event also incorporated the Annual Philatelic Convention. Displays from many societies filled 30 frames in the adjoining room alongside the well-patronised cafeteria. Beyond that area in the early afternoon two presentations from the Wellington Philatelic Society were well-attended by interested listeners. These presentations were by Andrew Sknar a members of the Wellington Society and Hutt Junior Youth Club who spoke on his exhibit ‘From Abacus to Computers’ and Sue Vernall who spoke on her three-frame exhibit ‘Fromology to Philately’ the story of cheese. The talks were followed by a meeting of representatives of Central Region societies. This allowed societies to comment on the EXPO with ideas for future events and gave one of the Central Region Federation delegates, Paul McTaggart, to provide and update on Federation activities and invite feedback. All in all another great philatelic day. Welcome to this first newsletter for 2019. 2018 went very quickly as so much happened. It has been nice to slow down a little over the Christmas break but now it is back to work. As I write this I’m trying to get last year’s work out of the way before everybody gets back on deck and the new onslaught begins. In philately, this year will another busy one. I aim to extend one of my exhibits and start a new one which will take some time, I look forward to the time when I can relax and spend a couple of months in the evenings just sticking stamps in my old albums. I’ve got about three cartons of material to sort though. Maybe I’ll have some spare time when I retire! [Those who have already retired tell me that might be a faint hope.] Besides Federation business I know NZ2020 will take up a bit of time. The executive have again been doing their best to get out to the different societies around the country, attending meetings or been asked to talk. I have been booked to talk to at least three societies this year. Others on the executive have also been booked but are also keen to get around the countryside. So if your society is interested please contact one of us (or, if you don’t know who or how to contact someone, contact secretary@nzpf.org.nz who will be pleased to help).